Turmeric Essential Oil (Curcuma longa) is also commonly known as Indian Saffron or Indian Yellow Root. Turmeric is part of the ginger family. The oil comes from the thick root of the herb. It has a fresh, spicy aroma similar to ginger. Turmeric has a base note of medium intensity. We included Turmeric Essential Oil as part of our Rocky Mountain Oils Wellness collection because it’s wide use in Chinese and Indian medicine. When diffused turmeric can promote deep relaxation. Learn more ways to use Organic Turmeric on the Rocky Mountain Oils Recipe Book! Step 1: Combine all ingredients in a glass container, like a 15ml bottle. Step 2: Massage onto sore and tired muscles and joints for relief. Step 1: Combine both ingredients into a glass container, like a 5ml bottle. Step 2: Massage mixture onto trouble spots on your skin to help improve your complexion. Step 1: Combine ingredients together in a glass container, like a 10ml or 15ml glass bottle. Step 2: Pour the blend into the palm of your hand, and then massage it into the scalp. Step 3: Let sit for 30 minutes to as much as overnight. Step 4: Rinse mixture out using your favorite shampoo. Step 1: Combine ingredients together in either your hands, or in a glass container, like a 10ml or 15ml glass bottle. Step 2: Apply to the hands, wrists, or knees as needed. Step 1: Add essential oils to a diffuser or personal aromatherapy inhaler. Step 2: Diffuse or deeply inhale for a boost in memory, congitive function, and concentration. Consult a medical doctor or certified aromatherapist if you are pregnant or breastfeeding. Turmeric oil is typically non-toxic, non-irritating and non-sensitizing. If you have questions or notice any adverse symptoms, discontinue use and consult a certified aromatherapist. Works well with carrier oil when applied to stiff and sore joints! Using it to diffuse during night time to guard against the flu bug! Very Pleased with Turmeric oil! I wasn't sure what to expect with this oil, but have been pleasantly surprised. I injured my knee shortly before ordering this and figured I would need to see my dr. I decided to try the turmeric first and just see. Long story short - no dr. visit. My knee feels better than it has in a long time. I used it twice a day while it was healing and continue to use it once a day to once every other day for maintenance right now. My husband has also used it on his knees, and in the process of rubbing it in, has found that his hands are feeling better too! Thank you for another great product! It arrived when promised and was packaged well. So far it has worked well for what I wanted it for. I am particular about where I order my essential oils and this is a great company to order from. I’ve used with carrier oil for joint pain. So far it has helped. I would recommend this oil. very pleased with this product, price and delivery. I am very pleased with oil. I was told that my "IT Band" was inflamed- so I used the oil-- fabulous! I will be able to resume my dancing! I use the spice, and the oil has the same smell, it’s easier to use and more versatile than the powder form, at least to me. This essential oil has been difficult to find. It's easy to find a CO2 extraction, but I wanted a steam distilled, therapeutic grade oil. Thank you, RMO for producing this true, therapeutic grade, organic turmeric essential oil! It's fabulous! A hard to find oil, worth it’s weight in gold! I love RMO, for now I can only tell in general since Turmeric was for my mom! But, what is the most impish for me - great quality, I trust RMO and it’s organic! Big plus! This one is not for me. Smells horrible and hasn’t helped me with anything. BUT I have found some recipes for different salves and creams I am going to try using this with. Can turmeric be taken internally? When adding Turmeric to a carrier oil, what would be a suggested ratio? BEST ANSWER: Great question! When applying topically we suggest between an 2-5% ratio. I have taken turmeric curcumin capsules, and was wondering if I switched to this, how would I use it to get anti inflammatory benefits for my whole body, not just one or two joints? BEST ANSWER: Hello! One of the objectives of the use of essential oils is for the therapeutic properties of the oils to be absorbed into the bloodstream. To best receive these therapeutic benefits, diffusion and topical application are advised. As the safety of our customers is our number one priority, we would recommend using on of these methods. All of our oils are 100% pure, natural, and authentic and they are of the quality to be taken internally. However, if done incorrectly, it can be very dangerous. At this time, we do not provide recommendations or suggestions on ingestion because the body can safely absorb essential oils by topical application or diffusion. can I tKWE BY MOUTH? Will it discolor my skin? BEST ANSWER: Great question! Once fully absorbed in to the skin it should not stain the skin. 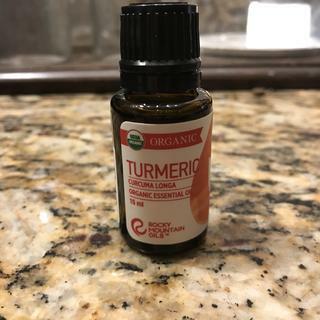 What extraction method is used for RMO Turmeric EO? The Turmeric Essential Oil is steam distilled. I take turmeric in a capsule recommended by my doctor. One of the things I hate the most is the smell and taste. Does this oil smell like the powder? I have never smelled the actual plant. Thanks! The scent of the oil will be true to the plant. Many factors go into the scent, such as growing conditions. If the scent does not settle with you, please feel free to take advantage of the 90 Day No Hassle Return Policy and Satisfaction Guarantee. Is turmeric essential oil the same as turmeric extract ? The oil is more concentrated than a typical extract and carries more of the aromatic compounds of the plant. Can you ingest turermic oil? Do you have to use black pepper oil with this product? I was told that black pepper helps in absorption. BEST ANSWER: This would depend entirely on personal preference. You are welcome to use this oil by itself or create a blend with other oils. However, essential oils are very potent and can be skin irritating so we would recommend diluting it with a carrier oil before applying it topically. Our general recommendation for dilution is 3-7 drops of essential oil per 1 teaspoon of carrier oil. Can I take Turmeric Oil internally?